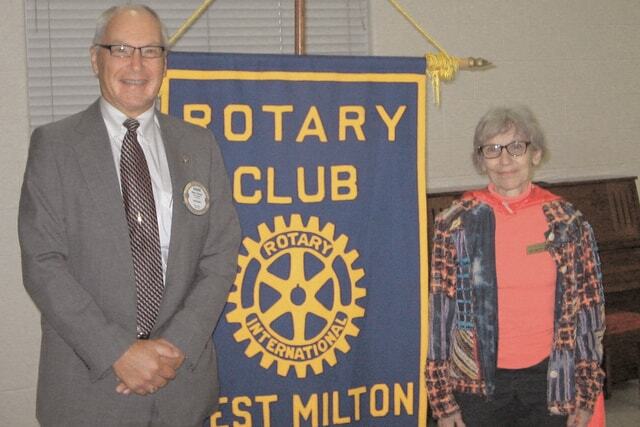 WEST MILTON — The West Milton Rotary Club program on July 13 was a presentation by the Milton-Union Public Library director, Carol Netzley Coate, guest of program host Matt Gingrich. Carol provided an update and overview of the programs that the public library provides the community. She explained the summer reading program for this year with the theme of Heroes. Recently, many of our local heroes, members of the police and fire departments, spoke to the children. Also to carry out this theme, the library was given access to the digital photos of the Hometown Heroes banners that honor our local military men and women of the past. They will post small versions of the banners in the library, a few at a time, to celebrate their service as local heroes. Throughout the summer, depending on the day and the age of the children, the programs will consist of puppet shows, reading aloud, and different activities such as games or finger play for improving fine motor skills, as well as different guests. The summer program is also for adults with crafts or training sessions in things like Pinterest. On Monday evenings they offer a writing program and on Saturday afternoon, they provide matinee movies. More money each year is used to purchase online materials. While many people in our community still prefer a hard copy of a book in their hands, more each year are reading books online. The library also purchases licenses for programs that provide huge data base for research and reading. The hours for the library on Monday through Thursday are from 10 am to 8 pm and on Friday and Saturday are from 9 am to 5 pm. More information can be found at the website of www.mupubliclibrary.org.